The first set of two stamps that were issued in 1968 was issued on January 31 on the eve of the International Year of the Human Rights. 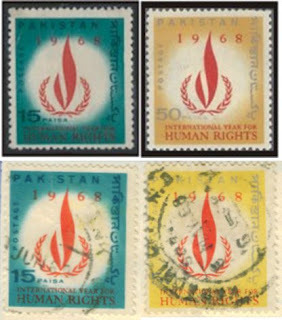 The two stamps of Paisa 15 and 50 displayed the emblem of the Human Rights ad were blue and yellow in colou respectively. The second stamp of the year was issued on 28 March on the eve of the First Convocation of the East Pakistan's Agricultural University. The stamp showed the building of the university and Memonsingh. The third issuance was a set of two stamps on April 7 to celebrate the 20th anniversary of W.H.O. The stamps were priced at Paisa 15 and 50 and were of green and orange red and red, orange and indigo in colour respectively. There were some rare stamps of Piasa 15 on which the word PAISA was written as PAIS, with letter "i" omitted. Kazi Nazrul Islam (25 May 1899–29 August 1976) was a Bengali poet, musician and revolutionary who pioneered poetic works espousing intense spiritual rebellion against fascism and oppression. His poetry and nationalist activism earned him the popular title of Bidrohi Kobi (Rebel Poet). Accomplishing a large body of acclaimed works through his life. On 25June 1968, a set of two stamps was issued of value Paisa 15 and 50 to honour the great man. 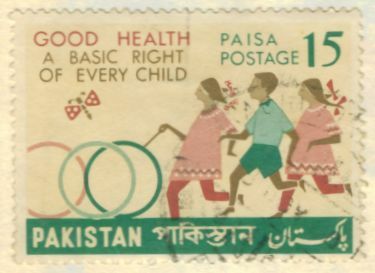 On 7 October, on the eve of the Universal Children Day, a commemorative stamp of Paisa 15 was issued with the theme for the year "Good Health - the Basic Right of Every Child" and three children shown running with hoops. 1968 marked the 10 years of the rule of President Muhammad Ayub Khan. The occasion was celebrated as the decade of Development throughout the country. The then government was rightly proud of its achievements as never in the history of Pakistan, the country had been so stable, progressive and developing. During these 10 years, Pakistan achieved many a hallmark, like the building of new capital city Islamabad, ushering in the TV era (first TV station set up in Lahore 24 November 1964), inauguration of first electric train between Lahore and Khanewal (though no successive governemnt could extend it an inch thereafter), besides providing stability and immense economic growth to the country. the establishment of the Pakistan Institute of Nuclear and Scientific Technology was another hallmark achievement of the government that later paved way for Pakistan to become a nuclear power state. In 1961 Warsak Dam was built near Peshawar to become the first major water storage reservoir of the country. Later two major mega projects namely the Mangla and Tarbela Dam were added to produce electricity and store irrigation water. During these 10 years, Pakistan's relations with the western world improved manifold. In 1964 Ayub Khan became the first head of the state to visit China - a visit that could never be replicated later by any other head of the state. The visit laid the foundation of very friendly and strong ties between China and Pakistan. China since then has become a time tested friend of Pakistan and has always supported Pakistan on all issue on the international forum. 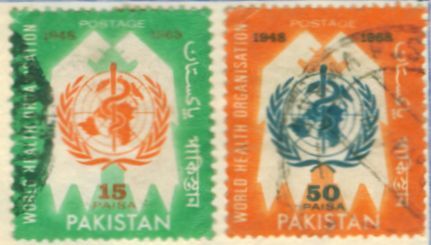 To commemorate the Decade of Development, a set of four stamps was issued on 27 October as shown above. 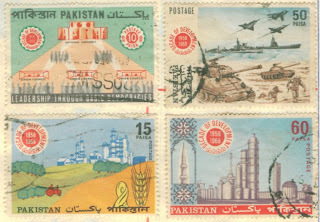 The stamps were valued 10, 15, 50 and 60 Paisa. 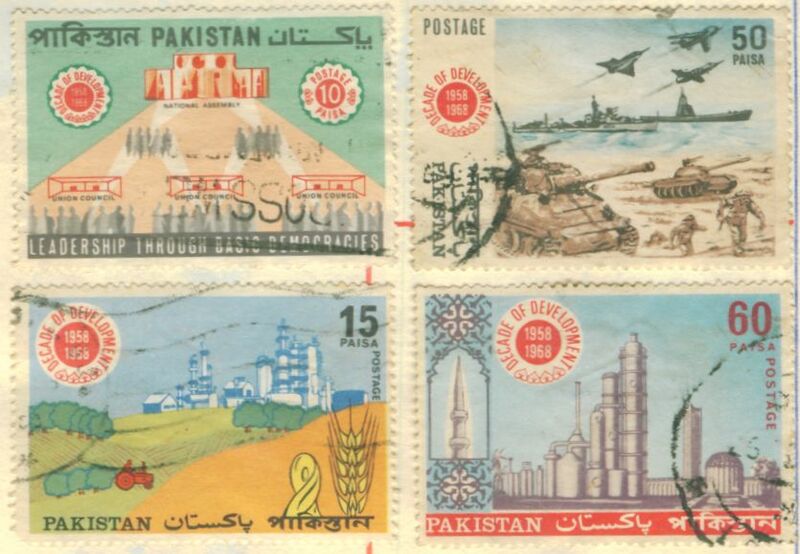 the 10 Paisa stamp (top left) showed the National Assembly building, the 15 Paisa stamp (bottom left) showed agriculture produce, the 50 Paisa stamp (above right) was dedicated to the armed forces of the country and the 60 Paisa stamp (bottom right) showed industrial plants and the atomic reactor.